On the 2018 track BOSS, from the album EVERYTHING IS LOVE, Beyoncé raps/sings: ‘My great-great-grandchildren already rich’. In fact, the whole song is pretty much about how much money her and her husband, Jay-Z, have. Of course, it’s not just about money, but more the mindset they believe you need to make that money. As Jay-Z contributes: ‘Over here we measure success by how many people successful next to you’. 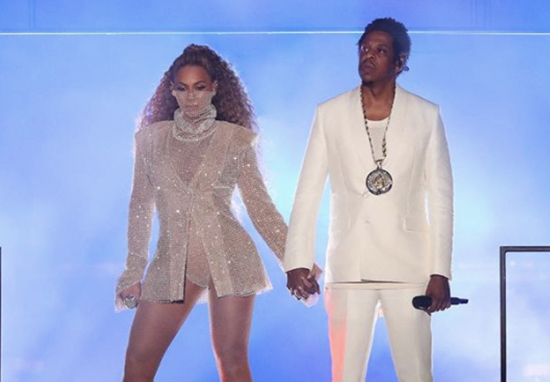 However, that being said, the Carters do have a fair bit of money between them, and thanks to their recent tour together, they now have even more. $253.5 million more, to be precise. The ‘On The Run II’ tour saw the pair play 48 shows in total, 18 in Europe and 30 in North America. It started on June 6 this year in Cardiff, and ended in Seattle on October 4. In London alone, where Jay and Bey did two nights to over 126,000 people each night, the couple grossed over $11 million. The tour’s biggest earner, however, was their two night stop at the Mercedes-Benz Stadium in Atlanta, which grossed over $14 million, according to Billboard. The tour, which was the sequel to 2014’s ‘On The Run’ tour, more than doubled what the original jaunt grossed – a measly $109.6 million, compared with this year’s $253.5 million. That’s a 132 per cent increase, with an average of $5.28 million per gig, and a total of 2,177,000 tickets sold. The tour coincided with the release of said album EVERYTHING IS LOVE, which came out just 10 days after the opening night and scooped 123,000 album-equivalent unit sales in its first week. The album recently won Album of the Year at the BET Hip Hop Awards. According to Forbes, Jay-Z and Beyoncé were already worth a combined $1.255 billion before this year’s tour. While Bey has made most of her money through record and ticket sales – often hitting the $100 million mark of pretax annual earnings, with a net worth of around $355 million – her husband draws a sizeable chunk from his business empire. Thanks to his various entrepreneurial endeavours – such as Tidal, Roc Nation Records, Roc Nation Sports, and The 40/40 Club – Jay-Z is reportedly worth around $900 million. Tidal, for example, was purchased by the rapper for $56 million two years ago. It is now valued at $600 million. One of the most memorable moments for me on the On the Run II tour was the Berlin show at Olympiastadion, the site of the 1936 Olympics. This is a site that was used to promote the rhetoric of hate, racism, and divisiveness, and it is the place where Jesse Owens won four gold medals, destroying the myth of white supremacy. Less than 90 years later, two black people performed there to a packed, sold-out stadium. When Jay and I sang our final song, we saw everyone smiling, holding hands, kissing, and full of love. To see such human growth and connection—I live for those moments.